garden. For adult couples who love classic tastes. 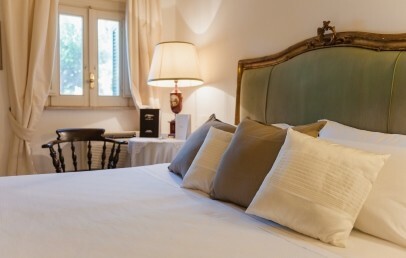 In the South of Italy and in the midst of majestic olive groves, half way between green hills and the blue Adriatic sea, the 5-star hotel Il Melograno is a beautiful position. The hotel is located about 3 km outside of Monopoli and about 60 km away from the airport Bari or around 70 km from the airport Brindisi. Special offer Country&SeaExperience available... contact us now for more information! It was realised in a fortified farmhouse of the 17th century furnished in style with old handcrafted carpets and paintings. Il Melograno with its typical architecture of Mediterranean constructions wrapped by the scents and colours of the big flowered garden, fits perfectly with the territory and beautiful landscape which surrounds it. 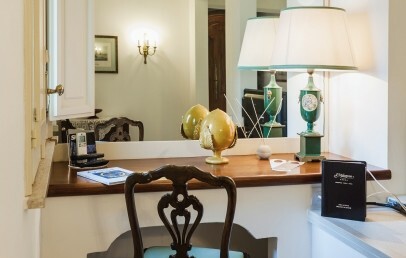 Among the 37 rooms which are lovely flooded by the sunlight and are furnished with antique furniture, real rarities which provide a cosy and welcoming atmosphere. 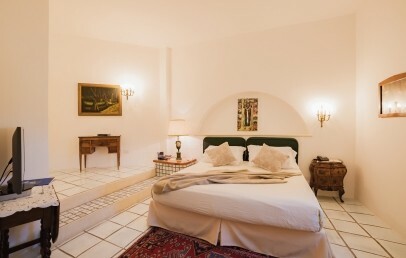 The rooms are situated facing the “piazzetta” which is dominated by olive trees, bougainvillea hedges, flower bushes and Jasmine or close to the orange and lemon grove. Some have a private patio. The main distinction is by the different room sizes: Deluxe is approx. 35 sq.m., Superior is approx. 47 sq.m., Junior Suite is approx. 55 sq.m. surface. All the rooms have a private bathroom with tub, air condition, mini fridge, safety box, satellite TV. A walk under the pergola of bougainvillea which leads to an orange and lemon grove where the entrance of the oasis of beauty is. A modern gym, a big indoor pool with enchanting view, a big hamam area of refined Moroccan inspiration. A large choice of massages and personalised cosmetic treatments and a relaxing area that offers you the sensation of total relax and well-being. A beautiful stairway, typical hand painted stones framed by flowered climbing plants which lead to the restaurant of Il Melograno where dinner is served in between enchanting olive groves which stand majestically on green English grass. The national, traditional cuisine, creative and extraordinarily various, celebrated with great knowledge, combines simplicity with chosen ingredients and a selection of precious national and regional wines. Bar and there is a wireless internet connection point the hall. The beach is surrounded by the scents and the colours of the Mediterranean vegetation, dominated by a huge dune and shady trees. It is located at 8 km distance and can be reached by shuttle bus from mid June until the mid September. In between the green you find 2 tennis courts with flash light, outdoor swimming pool and jogging path. A 18 hole golf club is nearby. The healthy Mediterranean cuisine is expressed exemplarily by the cooking school of Il Melograno. Cooking classes in a group or one-to-one, according to the client's wishes, exchange guided tastings with a personal touch. The fishing boat “La Madonna della Madia” takes you along the enchanting Ionic coast of Gallipoli, “the pearl of Salento”. A full day dedicated to the discovery of beautiful sandy beaches framed by rocks; lunch is served on board and it is also possible to rent deck chairs and sun shades on the famous beach “Punta della Suina”. City tax – € 2,00 per person/overnight, to be paid on-site. Children under 12 years are exempted. 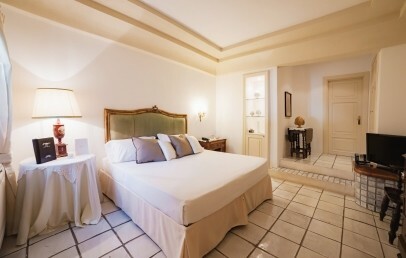 This lovely rooms are located in the central piazza colored by luxurious bouganvillea on the ground floor or first floor of the Hotel. 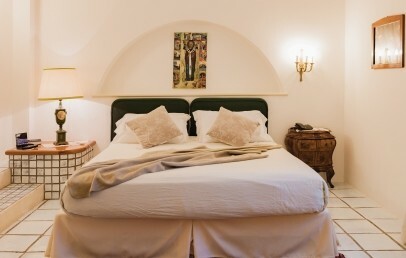 They are furnished with antiques and period carpets and they all have a queen or twin beds.The bathroom ha a bath tub and hairdryer. 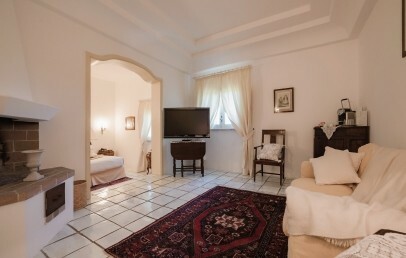 Those rooms are located on the ground or first floor, around the central piazza coloured by bouganvillea. They all have a king bed or twinbeds. 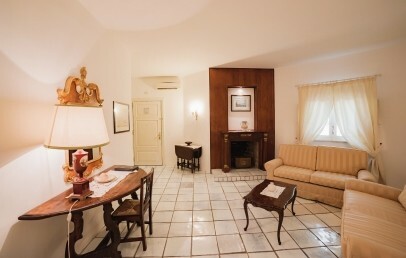 And are furnished with antiques and period carpets. The bathroom has a bathtub, a separate shower and hairdryer. Located in the orange grove. 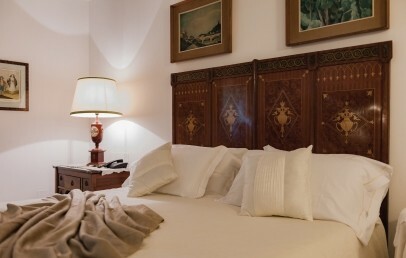 The Junior Suites are furnished with antiques funiture and carpets. They have a queen size bed and a bathroom with shower o tub and hairdryer. Some have a patio or a terrace with a lovely garden view.